The development cycle does not end with debugging. Debugging is something manual, but for testing and automation I want to develop scripts I can run in an automated fashion. 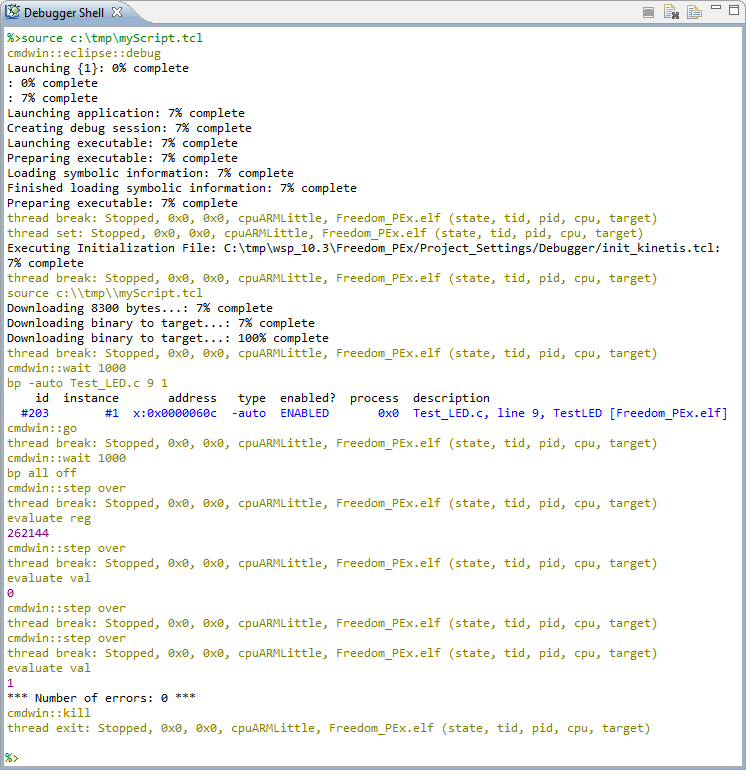 For this I use a tool in CodeWarrior: the Debugger Shell as command line debugger and using TCL as scripting language. This gives me a powerful way into automation and scripting with the debugger: from basic access to memory, to stepping and controlling the execution up to programming the flash memory. Before putting everything into a TCL script file, it makes sense to execute one command after each other from the Debugger Shell view. puts "Number of errors: $test_nofErrors"
It takes some time to get used to script automate things. But if done well, it saves a lot of time at the end. I’m still working through many details and exploring more functionality, but I think it is a good start. This entry was posted in CodeWarrior, Debugging, Embedded, Tips & Tricks and tagged CodeWarrior, Debugging, Tips&Tricks by Erich Styger. Bookmark the permalink. I think that’s amazing! It will be very handy for me as I often have very elaborate debugging setups that take lots of temporary breakpoints, etc. to get to the place I want to actually exercise. Was this stuff in the old Classic CodeWarrior 6.x, too? Bill, yes, a subset of this was already available in classic. But it was different depending if you were using S08 or ColdFire. Now in Eclipse based CodeWarrior things are unified and extended. Is the same functionality in KDS? or I should migrate to codewarrior for testing? CodeWarrior is using a custom scripting engine with TCL. This does not exist the same way in KDS (or GDB, to be precise). On the positive side, GDB has much more advanced scripting capabilities compared to CodeWarrior debugger engine. As a plus, you don’t need an IDE to run a GDB session, see https://mcuoneclipse.com/2015/03/25/command-line-programming-and-debugging-with-gdb/. So from this perspective, using GDB for testing is much better, plus you are independent of an vendor :-).